Okay, I get it now – the appeal of the Harry Potter series. All these years, I’ve thought, “I’m not interested in a children’s series. I’m not interested in wizards and fantasy.” But I get it now. The first book, Harry Potter and the Sorcerer’s Stone, left off with Harry and his Hogwarts friends returning home for summer break after their first year at the school of wizardry and witchcraft. In this, the second book of the series, the story opens with summer break coming to an end – and not a moment too soon for Harry, who has spent a miserable few weeks with his adoptive Muggle family, the Dursleys. Harry is visited in his bedroom by a house elf, who warns Harry not to return to Hogwarts – but returning to Hogwarts is what Harry longs for more than anything. After a dramatic rescue from the Dursleys by the Weasleys in an enchanted car, Harry does return to Hogwarts and embarks on a new year of wizard education, and a new adventure. And so the rumors and questions begin swirling: Slytherin . . . Where is the Chamber of Secrets? Who is the Heir? Who is petrifying Hogwarts inhabitants? 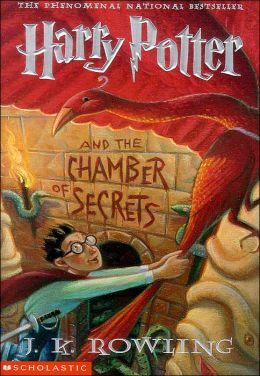 When Harry becomes a prime suspect, he is determined to get to the bottom of the Chamber of Secrets – and get to the bottom of it he does. Told with humor and just the right amount of suspense and intrigue, I was hooked, and finally closed the book feeling satisfied. I’m eager to get back to Harry and his friends at Hogwarts – but, as I’m committed to several other books at the moment, they’ll have to wait. Hopefully not for too long! I love how the books always have a pinch of humour..